Greetings, players of Shadow Era. It's Gondorian here, Shadow Era TCG Head Designer, and I'm back to continue our new spoiler series for Lost Lands part 2, which will be focusing on each of our seven classes in turn. Last time, we had a look at the Hunter class, and before that it was the Warrior class. This week, it's the Mages that we hope will enchant you. 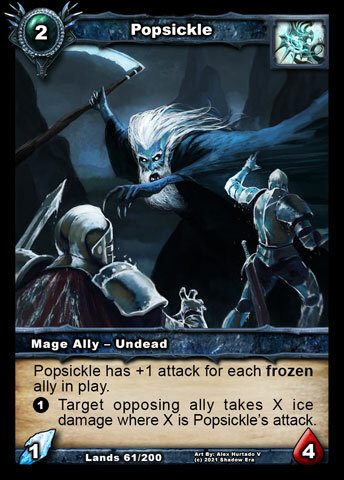 Popsickle - 2cc Mage Ally - Undead - 1ice/4HP - 0: Popsickle attacks target opposing frozen ally if able. 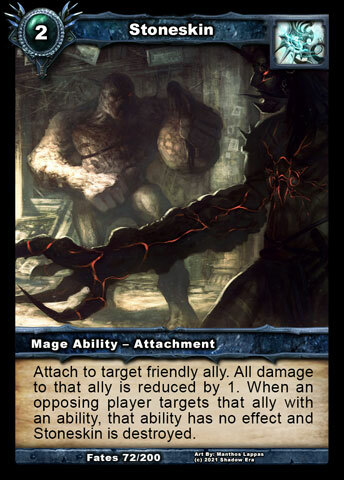 Subdue - 3cc Mage Attachment Ability - Attach to target opposing ally. That ally has Sustain 1HP and -2 attack. Allies adjacent to that ally have -1 attack. 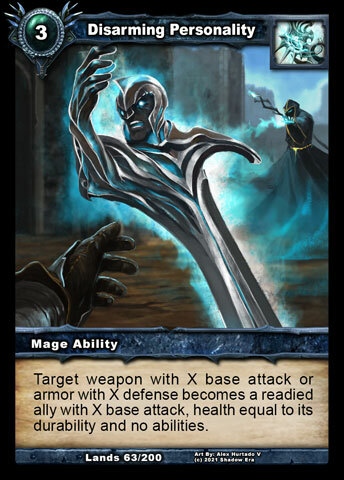 Disarming Personality - 3cc Mage Ability - Target weapon with X base attack becomes a readied ally with X base attack, health equal to its durability and no abilities. Leash of Life - 3cc Mage Artifact - While an ally is adjacent to your hero, that ally has immunity to enemy attachments and +1 health and its abilities cost 2 less resources to activate. 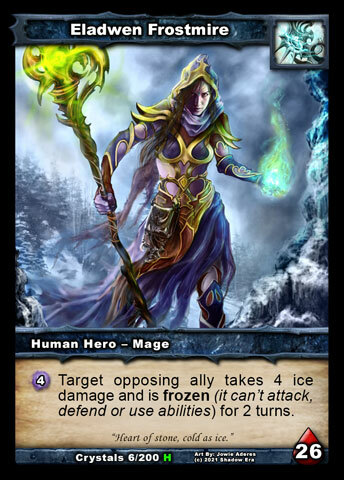 Living Ice Wall - 3cc Mage Artifact - While Living Ice Wall is a frozen ally, it has protector. 0SE: If Living Ice Wall is an artifact, it becomes an ally with 2 ice base attack and 5 health and it is frozen for 2 turns. 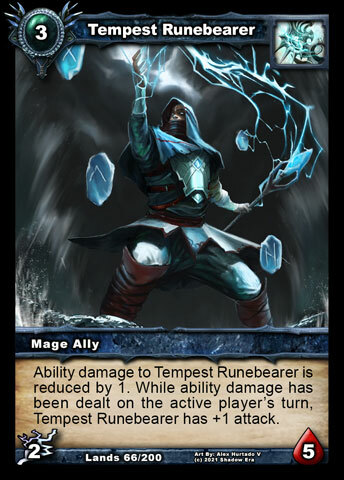 Tempest Runebearer - 3cc Mage Ally - 1electric/5HP - Ability damage to Tempest Runebearer is reduced by 1. While ability damage has been dealt this turn, Tempest Runebearer has +2 attack. 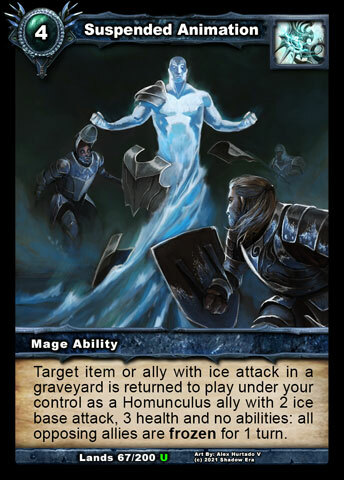 Suspended Animation - 4cc Mage Ability - Target item in a graveyard is returned to play under your control as an ally with 2 ice base attack, 3 health and no abilities: all opposing allies are frozen for 1 turn. 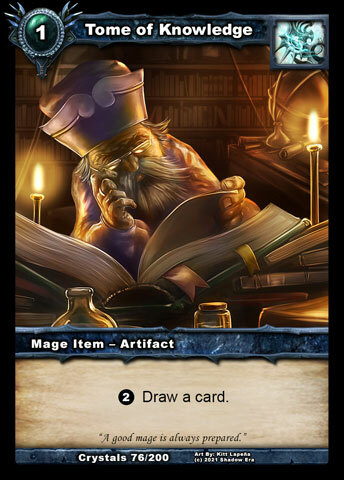 After looking over these cards, I hope you will agree we have come a long way in terms of marking out a clearer identity and direction for the class, with the idea of original magical spells becoming much more prominent. More specifically, three cards are focused on invoking transformations (joining Wand of Izikus and Transmogrification Curse) and two others represent localised bespoke ongoing effects (joining Consuming Fear , Incendiary Curse and Stoneskin ). 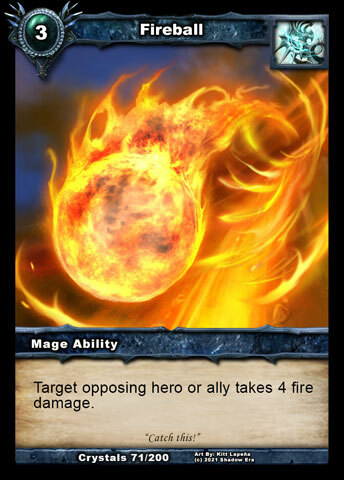 Some might say that this could be a bad thing - that cards like Fireball , Lightning Strike and Supernova will always be the signature Mage cards and we should stick to making more cards like that. Whilst I agree those cards will likely remain popular for years to come (and I like how easy it would be to code other variations of X damage for Y cost! 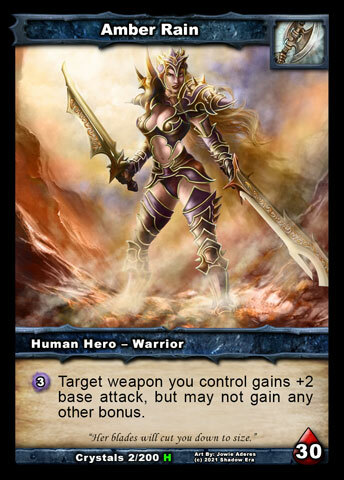 ), relying on similar cards for class identity severely limits how much generically useful ability damage and negative effects can be given to other classes without blurring the lines between classes too much. 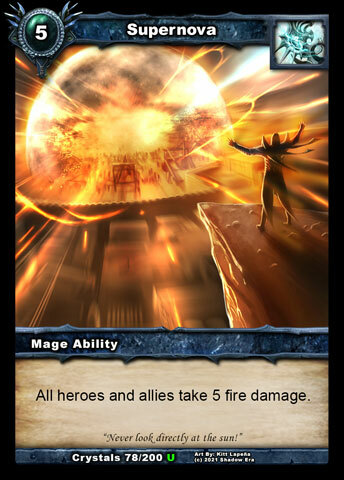 There's also a potential balance issue of creating too much redundancy and consistency for ability damage cards. So it's for these reasons, and the noble cause of just being more interesting, that we've been pushing the idea that our Mage Heroes have progressively learned more inventive and varied ways to dominate the battlefield. 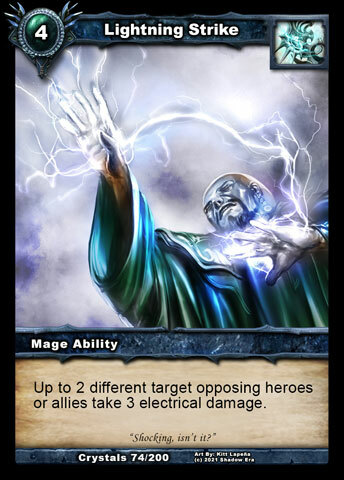 With all the magic out the way, we round out the seven new cards with two rather different allies: one that does ice damage and interacts with frozen allies; the other does electric damage and is intended to find its way into many Mage decks due to the combination of stats and abilities. Random fact: Popsickle is the first Undead ally that Humans have access to for deck-building (outside of Meltdown mode). 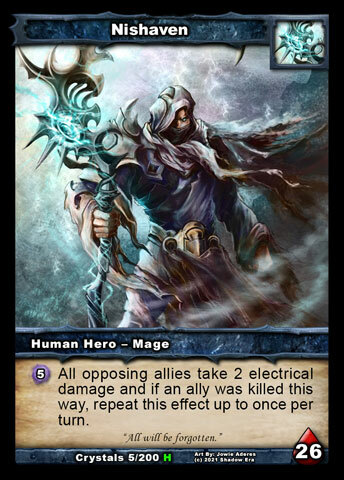 If this doesn't seem like enough new allies for Mages to use, the aforementioned transformation abilities can get you quite a variety onto the battlefield! 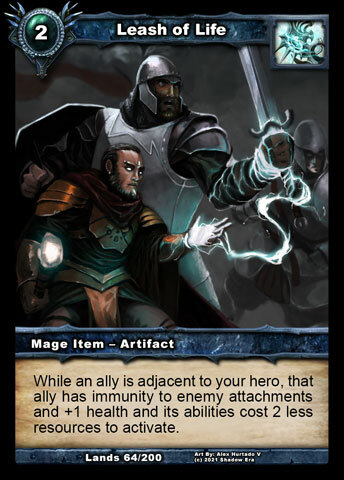 I don't know about you, but I really enjoy seeing some of our item artwork on cards in ally form (e.g. Thoughtful Investment , Tome of Knowledge ). If this is the kind of thing that conjures a smile on your face, be sure to share your personal favourites and any you are looking forward to seeing when these cards are released. As with the previous spoilers, I'd like to close by thanking you for your patience since Lost Lands Part 1 was released, and emphasise that we are revealing cards from Lost Lands Part 2 now without artwork to offer everyone a better opportunity to get involved with shaping their final form. Your feedback on how you think they will impact the game (whether that be their power level or fun factor or something else) and any ideas you have for their artwork are most welcome. Thanks for reading and I'll see you next time, where we will be weighing up what the Rogue class has to offer us. Last edited by Gondorian; 11-18-2016 at 01:36 AM. As a Mage loving player, I'm pretty excited to see these new cards in play! Looks like we might have more themed decks on the way. Heavy on the Ice it looks like. Mages this time! I'm a little out of it, but I'ma go ahead with my usual thing anyways. 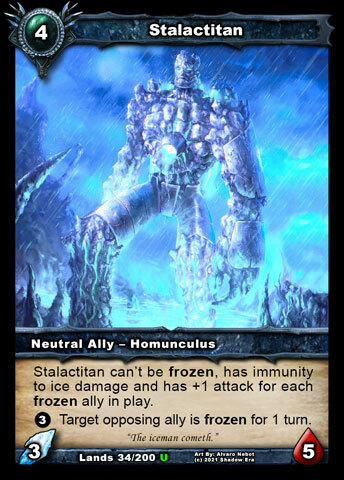 A 2 drop for the Ice Theme that's durable. His ability actually seems neat as he can essentially attack twice so long as there is a frozen opposing ally. Adjacent? This seems a bit weird to me since you can't really direct that too much. Anyways, seems okay if you would rather keep opposing allies around rather than killing them off (Stalactitan could be one example). Although, Sustain 1HP I assume is for the ally and not the opposing hero (there really should be a difference notated between those two). 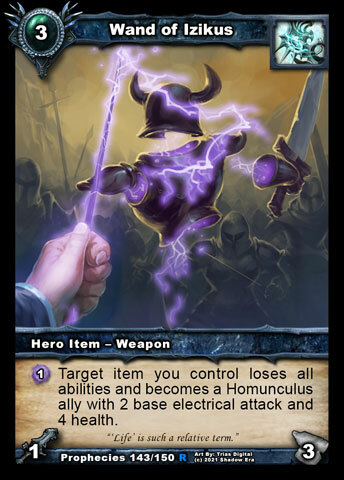 At first I wrote a whole speal about why this card seemed bad until I realized you could use it as Weapon Removal (i thought it was only friendly weapons at first). It went from a dud to a stud in no time flat! Turning your opponent's weapon into a readied ally seems great. Although, that's the assumption that you gain control of it? I really like the effect this card has. 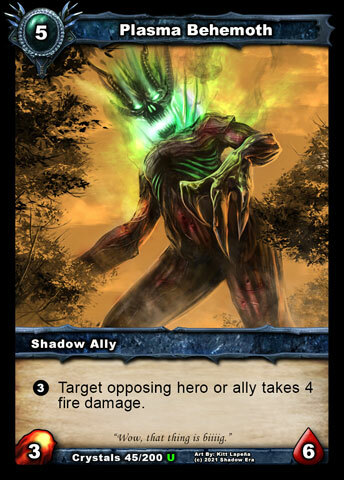 Again, the Adjacency thing is odd for Shadow Era but w.e. The fact that their abilities can cost 2 less resources opens up some more potential in a few allies we haven't seen in awhile. I like it. 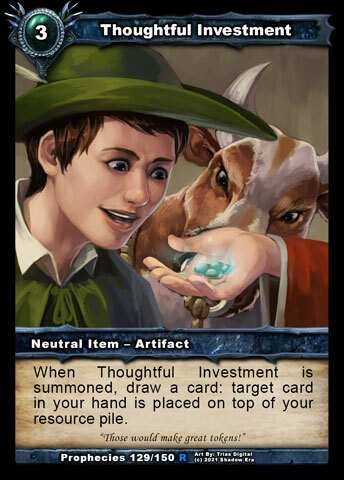 EDIT: The more I think about this card, the more I love it. Looking over all the allies, there are quite a number of them that could be a lot greater thanks to the +1 health and the ability cost reduction (of course the immunity to enemy attachments is fantastic too). 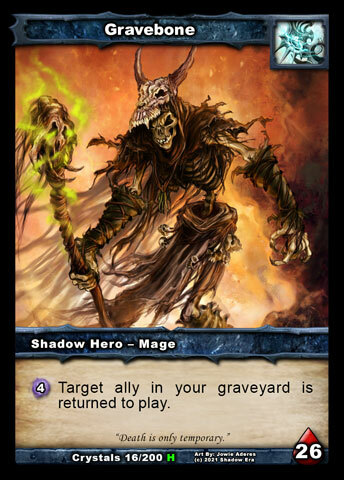 Gravebone in particular would love to have this around as it makes it that much easier to come back from an empty board with his ability. 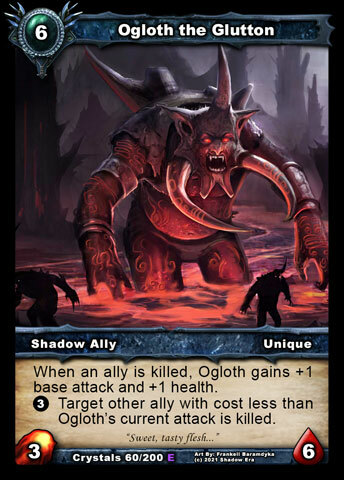 Cards like Plasma Behemoth and Ogloth are looking much better for our Skeleton friend imo! Cool idea (pun intended). Playing 3cc to at some point plopp down a 2/5 protector is great. 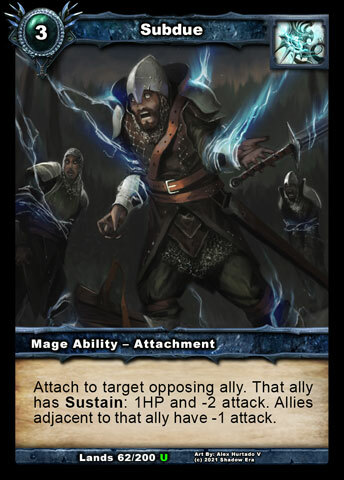 Also has Synergy with Lyth's Ridge and Stalactitan . Not too shabby. If you run a lot of spells or are playing Eladwen , Nishaven , or Majiya you could get some decent trades with this guy. Not to mention all the other little ways to deal just one ability damage (such as Krygon). It also punishes ability damage from your opponent by making it harder to trade with unless you hold off on your own ability damage first. Freezing all allies is pretty good, even if for just one turn. Guess were going all out on Ice atm huh? Wish one of these cards did a bit more with Ice damage itself seeing as Lyth's Ridge is currently the only thing. Oh well, maybe we'll see a weapon/armor or something. 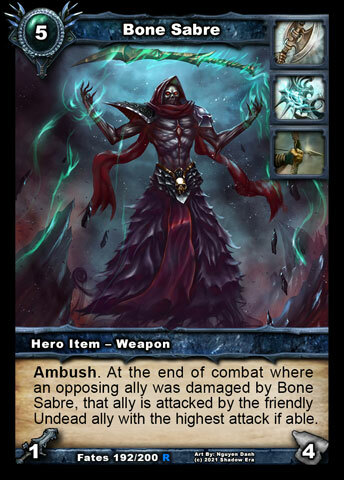 lol, I could just see SOMEONE trying to make an Eladwen deck where you use Bone Sabre to get as many attacks off your Popsicle as possible. At first I was a bit disappointed reading through these, but after thinking about them they seem like good additions. Especially since they are more for Mage decks that want to use Allies. Looking forward to them. Last edited by Demnchi; 11-18-2016 at 03:53 AM. Well I can say this. 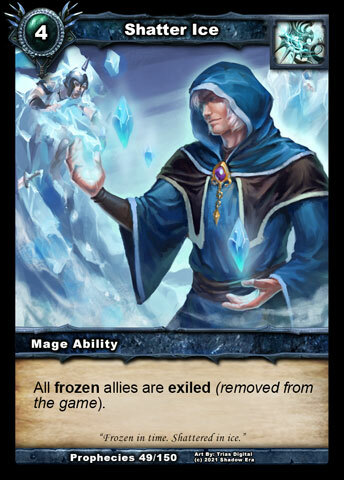 I have a Mage Ice/Frozen deck, will not say who. Popsickle , I will have to try it in replacement for the existing 2cc ally to see who is better. 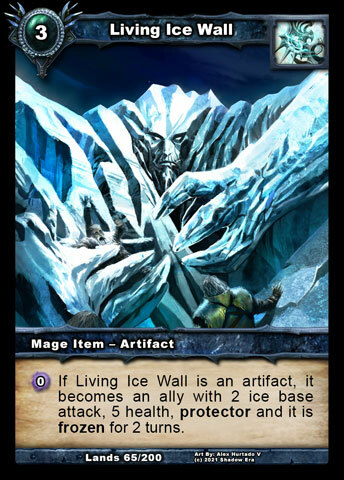 Living Ice Wall , unsure if I would make room for it, I figure it lasts 1 turn. That may be intent for all I know. Suspended Animation almost makes me consider trying to get to turn 8 for a combo with Shatter Ice . I also have an electric deck but cannot see putting Tempest Runebearer in place of an existing 3cc ally. Not saying it is bad, just not for that deck. Is it for non-electric themed deck? I could see it for 1 Mage now filling a third 3cc ally slot. There's something about Subdue I don't like, just too late to figure it out. I do like Disarming Personality and it is baitable so not too strong. 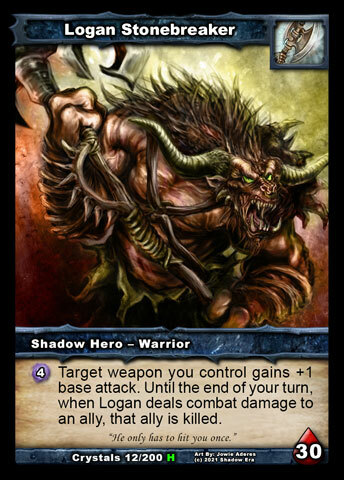 Curious how it affects Amber (strong hero) and Logan (weak hero). Subdue is op. It's max 5hp swing for 3cc on the turn it's played, and nullify several cards for one. It leaches 1HP every turn so cost damage ratio gets greater. Also it's nasty when you get to subdue multiple allies. You could choose to -1, -3, -3, -1 or -1, -2,-2,-2, -1 (5 allies) or -1, -2, -1, -1, -2, -1 (6 allies!!) with just 2 subdue. Other cards look underwhelming and not good enough to be played in my opinion. 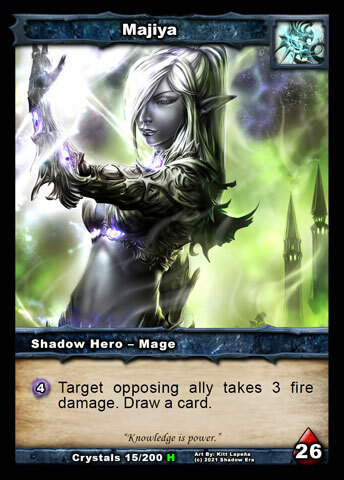 Except maybe Tempest Lunebearer that is good with t4 krygon for shadow Mage. Living ice wall is underpowered. It's mostly 3cc 0/5 protector ally which is not threatening enough. Only good point is that it can turn into an ally whenever you want (e.g. With board wipe) but that's not good enough imo. 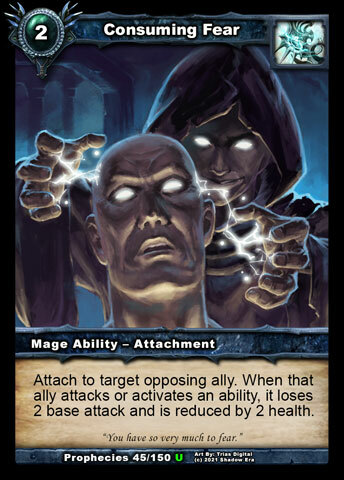 I think disarming personality should enable to turn opponent weapon into ally you control, just as Demnchi said. As I read it, it doesn't change the controller of the weapon and it's really not useful for a 3cc ability if it works that way. Suspended animation is good enough to justify 4 frying pan in a deck. It could be op. Last edited by Kylt; 11-19-2016 at 03:40 AM. Subdue - who gets the sustain damage, you, opponent or ally? what does adjacent mean? The next one (from both sides) or the one on the right (looking from owner of that ally)? Disarming personality - who owns the readied ally? If I cast it on opp weapon do I get an ally?